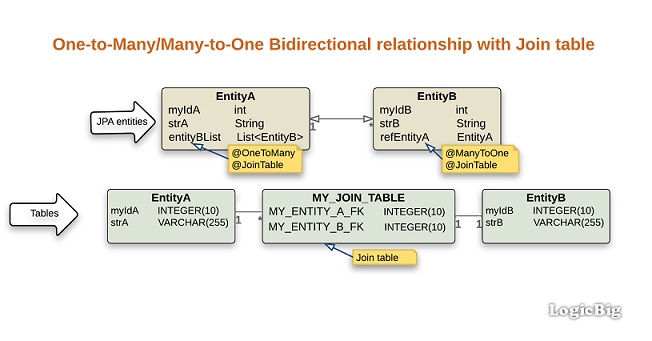 By default, a bidirectional OneToMany/ManyToOne association uses a foreign key column on the side which has the single-valued reference with @ManyToOne annotation. We can override this default by using an intermediate join table to persist the association. To achieve that we have to use @JoinTable annotation on the both sides. In this case, we don't have to use 'mappedBy' element of the @OneToMany annotation. Note that we have to use insertable/updatable=false on @ManyToOne side, to avoid persisting same relationship twice from both sides. When insertable/updatable=false, the column is not included in the generated SQL INSERT/UPDATE statements.